The first week of December was strange for me. I had just handed over my Doo Dah Queen reins and was feeling a little less shiny. But somehow, when you need it most, fate intervenes and brings back that sparkle in your life. I had been sent by my editor to learn about Knott’s holiday offerings. On a tour of the park, I saw all the pretty decorations, checked out the shopping, went on the Elf Mountain Christmas log ride and watched several shows, including the ice show, which was very impressive. Next I was taken “backstage” to see the parade staging area. You see where this is heading…. 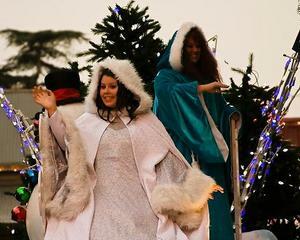 Well before even I knew it, I found myself in a costume and serving as a Snow Queen on a float in Knott’s Christmas parade!! Hmmm…. Perhaps I should stop trying to appear as a commoner and just accept my calling….